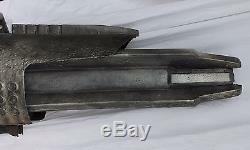 For your consideration is this Season 5 Falling Skies 2nd Mass Gatling Gun Movie Prop from the original TV series "Falling Skies". This item was acquired from a reputable prop house near Los Angeles, CA. Season 5, Episode 1 (35:12 minutes) - The Gatling gun was first used by in the 2nd Mass raid on Wilson High School to find an Espheni Overlord. When the 2nd Mass is ambushed by dozens of Skitters in complete darkness, Colonel Dan Weaver (Will Patton) orders, Let's see what those things can do! Hal Mason (Drew Roy) and Dingaan Botha (Treva Etienne) rush forward with their Gatling guns and unleash a torrent of ammunition into the Skitter-ridden bleachers. Dingaan also uses the Gatling gun defend the 2nd Mass installation against Skitters in Season 5, Episode 2 (0:34, 0:47, 1:26, 1:35 minutes). The gun's sturdy design includes a shield over long extension arms surrounding an embedded pipe, ribbed hoses which twist'round the front, and thin red tubes that appear to deliver fluids to the gun. A replica of a small, black alien head with red eyes is seated in the middle of the gun's housing, looking down the gun's barrel as if guiding the shot. Made of wood, foam, latex, and metal. This is an authentic "Falling Skies" TV prop. Please feel free to ask any questions. The item "Season 5 Falling Skies 2nd Mass Gatling Gun Movie Prop Set Decoration" is in sale since Monday, September 14, 2015. This item is in the category "Entertainment Memorabilia\Movie Memorabilia\Props\Originals". The seller is "meeko33382pg" and is located in Brentwood, California. This item can be shipped to United States, United Kingdom, Denmark, Romania, Slovakia, Bulgaria, Czech republic, Finland, Hungary, Latvia, Lithuania, Malta, Estonia, Australia, Greece, Portugal, Cyprus, Slovenia, Japan, Sweden, South Korea, Indonesia, South africa, Thailand, Belgium, France, Hong Kong, Ireland, Netherlands, Poland, Spain, Italy, Germany, Austria, Israel, Mexico, New Zealand, Singapore, Switzerland, Norway, Saudi arabia, Ukraine, United arab emirates, Qatar, Bahrain, Croatia, Malaysia, Brazil, Panama, Jamaica, Barbados, Bangladesh, Bermuda, Brunei darussalam, Bolivia, Ecuador, Egypt, French guiana, Guernsey, Gibraltar, Guadeloupe, Iceland, Jersey, Jordan, Cambodia, Cayman islands, Liechtenstein, Sri lanka, Luxembourg, Monaco, Macao, Martinique, Maldives, Nicaragua, Oman, Peru, Pakistan, Paraguay, Reunion.